The Civilian Conservation Corps (CCC) was established by President Franklin D. Roosevelt in 1933 as part of the comprehensive relief effort during the grim depression years. 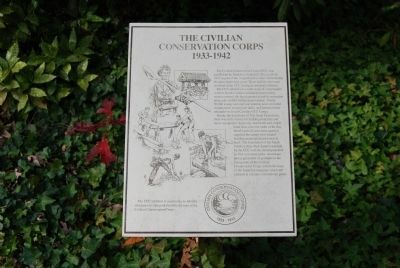 Three million men were involved in the CCC during its ten-year existence. 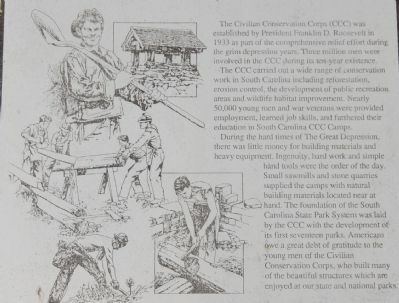 The CCC carried out a side range of conservation work in South Carolina, including reforestation, erosion control, the development of public recreation areas and wildlife habitat improvement. Nearly 50,000 young men and war veterans were provided employment, learned job skills, and furthered their education in South Carolina CCC Camps. which are enjoyed at our state and national parks. Location. 34° 51.917′ N, 83° 6.325′ W. Marker is in Mountain Rest, South Carolina, in Oconee County. Marker is on State Park Road. Touch for map. 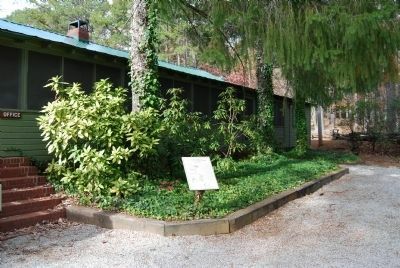 Marker is at or near this postal address: 624 State Park Road, Mountain Rest SC 29664, United States of America. Touch for directions. Other nearby markers. At least 10 other markers are within 4 miles of this marker, measured as the crow flies. Civilian Conservation Corps Monument (here, next to this marker); Oconee State Park (within shouting distance of this marker); Cherokee Boundary (1777) (within shouting distance of this marker); The Oconee Waterwheel (about 500 feet away, measured in a direct line); Oconee Station / Oconee County (approx. 2.4 miles away); Oconee Town (approx. 2.8 miles away); Tamassee Town (approx. 3½ miles away); Stumphouse Mountain Tunnel (approx. 3.9 miles away); Stumphouse Tunnel (approx. 3.9 miles away); Issaqueena Falls (approx. 4 miles away). Touch for a list and map of all markers in Mountain Rest. Credits. This page was last revised on June 16, 2016. This page originally submitted on December 10, 2008, by Brian Scott of Anderson, South Carolina. This page has been viewed 1,014 times since then and 10 times this year. Photos: 1, 2, 3. submitted on December 10, 2008, by Brian Scott of Anderson, South Carolina.